All leagues are open to golfers of all ages and abilities. For more information on any of the leagues listed below please call the Lonnie Poole Golf Course Golf Shop at 919.833.3338. Join us on Monday afternoons for a weekly nine-hole golf league. With a two-player blind-draw format you can play with friends or meet new players! The weekly fee covers fees and prizes. To register, turn in your registration form to the Golf Shop. For more information call 919.833.3338. Monday nights 4:00-5:30 p.m. (April, May and September), 4:30-6:00 p.m. (June, July and August). 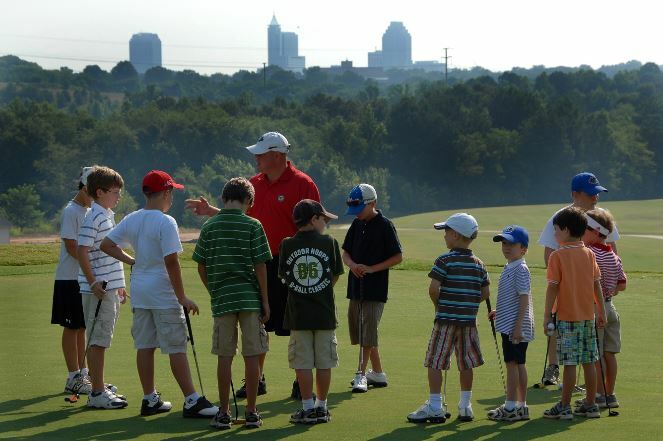 Great for beginners and experts alike, Golf and Grape is a social league for all players. This league offers instruction on all aspects of the game and a glass of wine from the Terrace Dining Room! Call 919.833.3338 for more information or to be added to our email list! Thursdays at 5:00 p.m. $30 weekly fee. Open to boys and girls ages 7 to 16, the Lonnie Poole Little League offers your player an opportunity to train in a team setting while learning from the Lonnie Poole Professional Staff. Players will practice once a week for eight weeks with their assigned team coach and will compete in biweekly matches for prizes and awards. Pack Nine is a Friday afternoon social league for players of all skill levels. This league is scored on individual stroke play with season prizes! Call 919.833.3338 for more information. To register, submit your registration form in the Golf Shop. April 5 tee times start at 4:00 p.m. Sign up today! Join us the last Saturday of every month this season (February-October) for a two-player Scramble Championship Series. This event is open to the public. Pre-register by turning in your registration form in the Golf Shop.